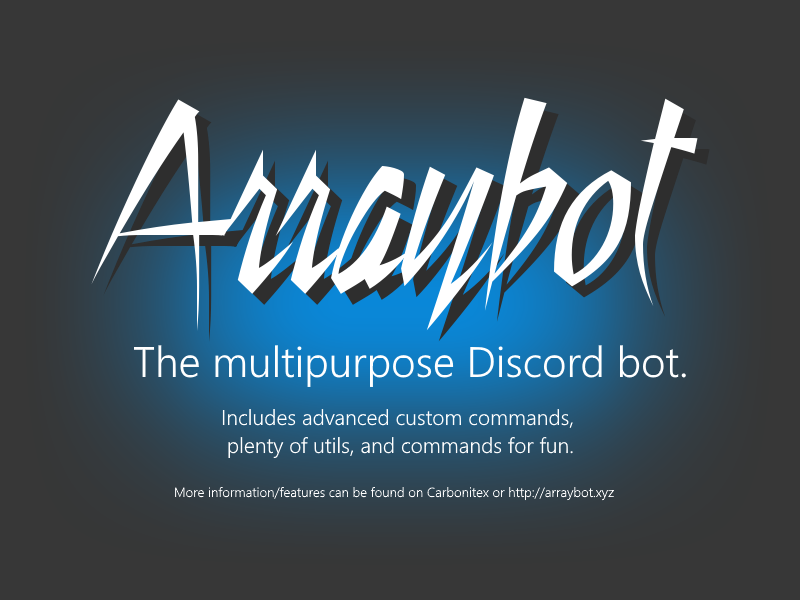 Arraybot is a Discord bot written in Java, using the JDA library. The bot's goal is to aid with certain activities, and to customise your Discord experience to your need. Arraybot is capable of running 100% on it's own, all you need to do is add the bot to your guild. Here are some features Arraybot comes packed with out of the box. Arraybot is designed to be a fast and efficient helper to make your guild better. From advanced custom commands that do not just send message to autoroling to join and leave messages - Arraybot comes with it. No guilds are the same, hence Arraybot strives to deliver the best flexibility for each individual guild. You, the users, matter. Arraybot consists of a large proportion of user suggestions, because it's your bot too. Here is a quick start guide. For more in-depth usage tutorials please visit the wiki (click me). Invite the bot to your guild. It is strongly reccomended that you give the permissions listed automatically. Execute "//help" - this will show a list of command categories. Execute "//help categoryname", replacing "categoryname" with a category name listed in "//help" for a list of commands concerning that category. You can also execute "//help commandname", replacing "commandname" with a command name (without prefix) to find out information about that commands. That's it! Feel free to play around with the commands! Here are some user-submitted testimonials for Arraybot. I mostly use it for custom text commands as it's the only bot I could find that has the ability built-in to build some complex reply strings on the user end. Arraybot has been incredibly helpful for sharing information and updates with the thousands of users in our class Discord. The ability to easily update chat commands to provide new information and send that information out through appropriate channels (in chat or privately) has helped to simply our moderation and keep updates consistent amongst thousands of users. The developer smells like pie. Arraybot has been a huge boon to our community. Its custom commands allow us to more easily disseminate information to thousands of our users without the performance issues we've run into with other bots. To top it off, the developer has been very responsive to feedback. I highly recommend Arraybot for any large or small discord community. Copyright 2017. Website and bot by Arraying, using Skeleton CSS.